The Art History and Visual Studies BA and MA students helped to create Marcantonio Raimondi and Raphael: the first exhibition in more than 30 years on one of the Italian Renaissance’s most important printmakers, and the first ever to take place in the UK. Running at the University’s art gallery, The Whitworth, the exhibition includes many world-class prints in excellent condition, as well as a digital feature showing off the Spencer Album of Marcantonio prints, long presumed lost and only recently rediscovered at John Rylands Library by Dr Ed Wouk, Lecturer in Art History at Manchester. Students helped to put together the concept, chose some of the objects and wrote catalogue entries. “I can’t think of another instance in which students have been so fully involved in an exhibition of this scale,” says Dr Wouk, who – together with the Whitworth’s Head of Collections, David Morris – was the driving force behind the exhibition. Dr Wouk placed this unusual and innovative learning experience at the heart of his Renaissance Print Cultures course unit, offered to third-year BA and MA Art History and Visual Studies students at the University. 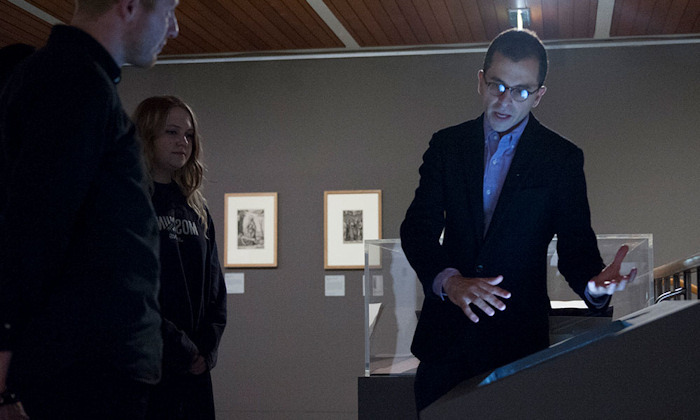 The students not only engaged with world-leading research in Renaissance art history, but also worked alongside academics across the Faculty of Humanities and curators at the Whitworth, John Rylands Library and Chetham’s Library, in order to bring this research into the public realm on a major international platform. BA (Hons) French and Art History graduate Max Weaver relished the chance to undertake work that had an impact beyond his personal ambitions. “Being able to research something for an exhibition gave me more motivation to do a good job than simply writing an essay to get a good grade,” Max says. “Exhibitions like this are important to the public. Here, I was presented with an opportunity to write and research for the benefit of others. “Gaining invaluable insight into the organisation of exhibitions gave me something to talk about during my job interview, and may well have contributed to getting me where I am today,” continues Max – who, after graduating from Manchester with a 2:1 this summer, is now a gallery manager at a fine art dealer in London. Writing an entry for the exhibition catalogue – published by Manchester University Press – proved to be a challenge far removed from the students’ usual experience of academic essay-writing. Some of the students’ involvement – and associated skills development – has extended still further: MA student Danielle Gravon wrote a blog for Manchester University Press on her experience and is now giving public tours of the exhibition. “Giving tours has been a lot of fun; the audiences have been really engaged and full of questions,” Danielle says. “I was really nervous when I began, because I’m not a very confident public speaker. It’s given me an opportunity to work on that. Dr Wouk describes the overall experience as a “roving careers fair” for his students, who not only immersed themselves in Renaissance art and printmaking techniques, but also learned about contemporary cultural engagement work related to art history, including conservation, librarianship and publishing. “What better way to learn than through collaborating with others in the University, working together on shared projects and with shared goals – in short, becoming students who are also partners in shaping our cultural heritage?” he asks. Marcantonio Raimondi and Raphael runs at The Whitworth until 23 April 2017.